This star field is situated near the much more famous M78. 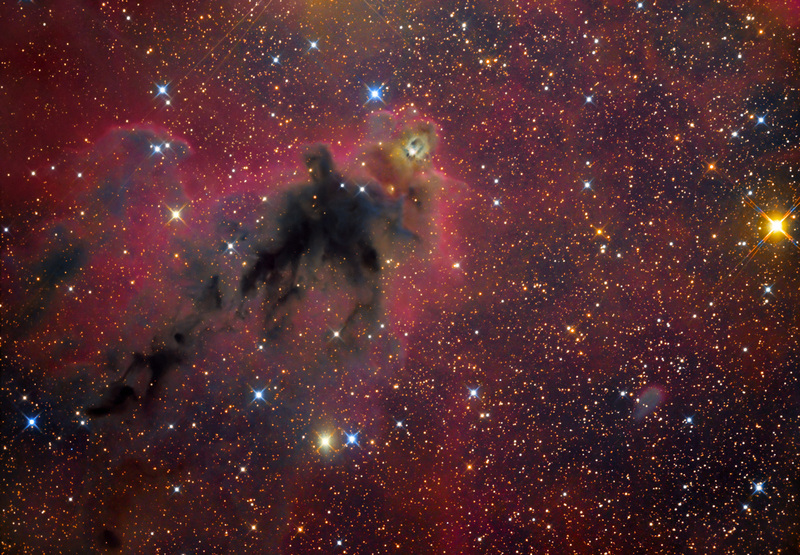 The two dark nebulae (LDN 1621, smaller, near the left border and LDN 1622, much bigger near the center) are projected onto a complex and extensive emission nebulosity known as Barnard's Loop, inside the molecular cloud complex named Orion B. Both nebulae are believed to be 500 light years away, much closer than the bright red hydrogen nebulae that shine behind them from about 1,600 light years. Other objects on this image are VdB 62 (just right of LDN 1622) and VdB 63 (the smaller yellowish nebula below). Both are reflection nebulae. For clarity there is a mouseover, which shows the objects and their names. 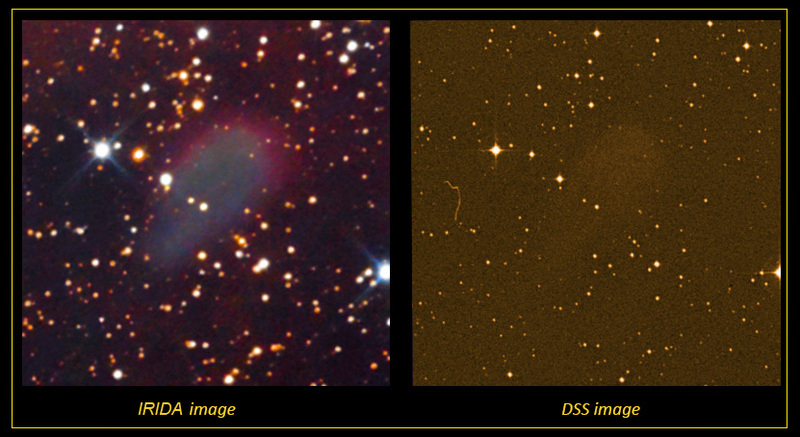 There is another object (probably a planetary nebula), which we couldn’t identify. It is missing in all catalogues that we have checked (including PLN), but is clearly seen on DSS plates (see the image below), which makes hard to believe that this object is not yet catalogued. Its coordinates are approx. RA = 05h 56m 06s, DE = +01° 14’ 05”. Below you can find a magnified crop of this object compared with the corresponding DSS image.The subframes of this image were acquired in a long period of time (between November 2012 and February 2013) Since in begin of December we had to rotate slightly the camera (in order to improve the balance), the orientation of the subs are different. This explains the double star spikes. The tiny lines at the top left are spikes from the 4.8 mag star 56 Ori, which has produced the slight greenish halo too (above VdB 62, near top border).